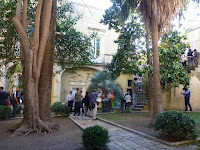 The Lecce Italian Language Experience: Two Italian language tours in 2016. Bookings are now open for September 2016. Some places still left for May. Two Italian language tours in 2016. Bookings are now open for September 2016. Some places still left for May. I am pleased to announce that there will be two language tours in 2016 - in May and in September. Bookings are now open for the September 2016 Lecce Italian Language Experience while there are still places available on the May 2016 tour. Click on the following links for all the details. Over four fabulous weeks, the Lecce Italian Language Experience will immerse you in the Italian language surrounded by the culture, history and culinary delights of Lecce and the Salento. Whether you have already been to Italy or whether it is your first time, Baroque Lecce, the School of Italian for Foreigners and the unexplored south are waiting. A truly memorable experience in this amazing part of Italy is guaranteed. return airfare to Italy and one-way connecting flight to Brindisi. For that something extra special you can join me and local chef and food identity Gianna Greco from 10-19 October on the inaugural Salento Food and Wine Experience. I invite you to come with us on a unique luxury 10 day food, wine and cultural experience with the very best that this incredible region has to offer. Call or email me if you would like me to answer any questions or click on the link below for more information. Prices are quoted in Australian dollars. As always enquiries from people outside Australia are most welcome. Prices will be adjusted according to your local currency and airfares from your location.